The NZD and the AUD were two of the weakest currencies at the close yesterday after the Dow shed over -800 points and the Nasdaq fell -4%, but today they have moved to the top of the table despite more weakness called in the early NY stock trading (at least at the moment). 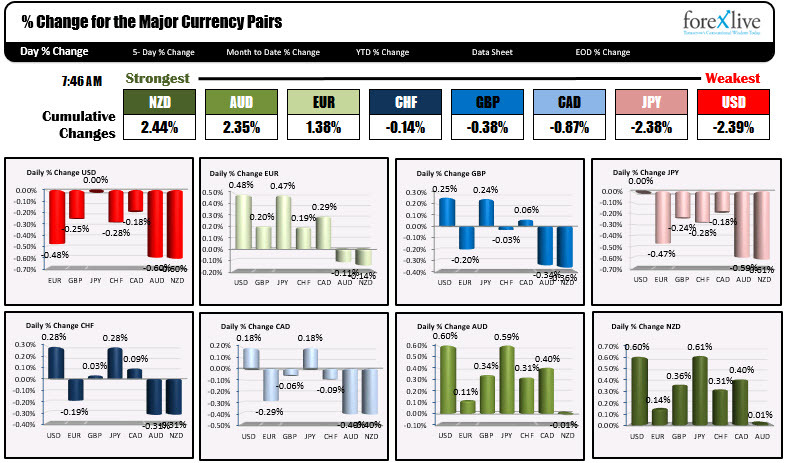 The USD and JPY are the weakest. The JPY was the strongest currency yesterday. In addition to the stock opening at 9:30 AM ET, the US will release the CPI and initial claims data at 8:30 AM ET. Focus will be on the CPI with expectations of 0.2% for headline and core numbers. 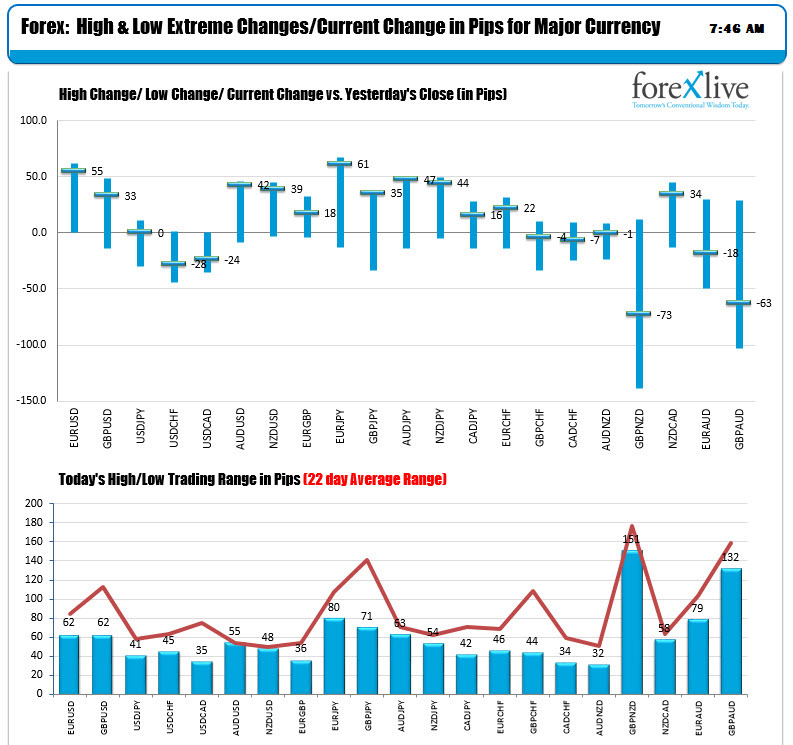 The ranges for the major pairs against the USD are somewhat contained with the most below their 22-day averages. The EURUSD and the GBPUSD are trading near the highs but in the process move up and down and back up again. The USDJPY scraped along a bottom but has moved back to unchanged on the day. The JPY crosses — hit hard yesterday — are trading near highs for the day at the North American opening. Bitocin on Coinbase exchange has cracked lower and is trading down -$337 at $6193. The price broke below the September lows near $6100, but has rebounded back above that level. Key levels today in the S&P is the 200 day MA at 2765.51 and the 100 day MA at 2822.36. The price yesterday closed between the two at 2785.68. The implied opening is expected to open below that level but data out and still an hour or so to go to the opening. US yields are higher by a basis point or 2. The US treasury will auction off 30-year bonds today. The 3 and 10 year note auctions were met with less than stellar demand (is China boycotting). Despite the sharp drop in stocks, the US yields were reluctant to go lower (they did end with declines yesterday by -1 to -4.6 bps). Usually there is a flight into the safety of the US debt. The benchmark ten-year yields in your Europe are mixed with flights into the safety of the German, France and UK (lower yields) and exit out of Spain, Italy and Portugal (higher yields).